words by Abdul Musa Team of the week for friendlies commencing 5th March 2014. As this is part of the World Cup coverage, I’ve decided to base the team of the week on the 5 nations who are going to Brazil. GK: Vincent Enyeama (Nigeria) – Regarded as the best goalkeeper in Africa, Vincent Enyeama has carried his impressive club form with him into national duty, yet again keeping a clean sheet against Mexico. LOSC Lille’s number one was fantastic for Nigeria, making save after save to keep his team in the game. His world class save from a Rafael Marquez header was enough to enforce his burgeoning status and to prove he is Nigeria’s finest. With this beast between the sticks, no doubt Nigeria are sorted in goal for Brazil 2014. RB- Aissa Mandi (Algeria) – Perfect debut from the young Reims right back who barely put a foot wrong throughout the match. With 37/39 passes completed, 4 tackles and 2 interceptions, the young man shined much to the delight of Valid Halilhodzic who heaped praise on his defender saying he has ‘enormous qualities’. CB- Liassine Cadamuro (Algeria) – Commanding performance from the Mallorca man. Cadamuro was solid throughout the game as the Algerian defence limited Slovenia to only 2 shots on target. He completed 58/66 passes, 4 tackles and 3 interceptions, as well as 3 dribbles from the back, looking very composed on the ball. CB – Kenneth Omeruo (Nigeria) – Nigeria’s best defender on the night for sure, snuffed out any danger, rescuing his team on numerous occasions. Seeming to grow in confidence as the games roll by, the20 year old will surely be first choice in Brazil most likely to partnerGodfrey Obabona in defence. LB – Elderson Echiejile (Nigeria) – Although he doesn’t feature much at club level with AS Monaco, Echiejile proves again that no one can beat him to the left back spot in the Nigerian set up. Another very good performance, pushing up a lot to overlap and exploit spaces in the Mexican back three, as well as limiting Herrera to any sight of goal. RM- Kevin-Prince Boateng (Ghana) – Ghana’s biggest threat by far on the night, in what was one of poorest performances by the Black Stars in a while. He managed to get 2 shots on target, one saved comfortably by the keeper and the other blocked off the line from a corner. All in all, Ghana did not create much going forward, and conceding a penalty 9 seconds into the game didn’t really help their cause. CM – Saphir Taider (Algeria) – Arguably the best performer on the pitch for Algeria, the midfield maestro managed to bag a goal and assisted Hilal Soudani for Algerias second. 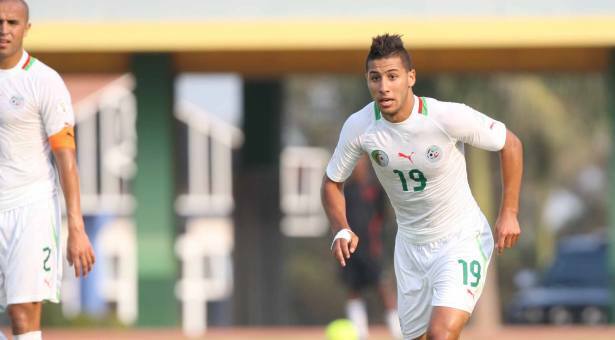 He recorded a 88% pass success rate, two tackles, one interception plus his goal and assist; Taider was influential in Algeria’s impressive victory. CM – Serey Die (Ivory Coast) – Undoubtedly Ivory Coast best performer, Serey Die managed another bullish performance in the heart of the Ivorian midfield. He wasn’t really helped by Ivory Coast’s shambolic defending that Lamouchi will definitely have to reassess before boarding the plane to Rio. LM – Abdelmoumen Djabou (Algeria) – The only African based player in this XI, outshining the Gervinhos, Ahmed Musas etc , the Club Africain man proved a handful for the Slovenian defence. Djabou’s display consisted of pace, power and technique, wrecking the Slovenian defence throughout the game. He also provided a world class, left-footed cross only for Soudani to blast over from six yards out. ST – Vincent Aboubakar (Cameroon) – One of Cameroons best performers in a night the Indomitable Lions will want to put behind them and fast. He tried his best to lead the line, managed to grab an equaliser for his team in hope of getting something out of the game. Remarkably, despite Finke playing three defensive midfielders, Cameroon conceded five. ST – Didier Drogba: (Ivory Coast) – Typical Didier Drogba performance, the Ivorian beast proved a handful for the Belgian defence causing problems all over the pitch. Also managed to score a very important goal that put his team back in the game. Player of the Week: Stuck between Vincent Enyeama, Serey Die and Saipher Taider. YOU DECIDE. Kevin Prince Boateng in the team errrrm am a bit surprised since he wasn’t at anywhere near his form during the Montenegro and Ghana game, I think he’s the only one I will take out of this team, apart from that it’s the right team from the mid week games.